Green is definitely the new black. The Eco trend looks set to continue through 2008 and beyond and it’s just as much about materials as it is attitude. Here are six smart ways to greener living that have risen to the top of the heap. 1. Safer Sipping: Take your next drink from aluminum, stainless steel, glass or plastic drinking bottles made without bisphenol A, a potentially harmful and increasingly controversial chemical found in polycarbonate plastic. Recent research has shown the chemical, which mimics estrogen and is a known developmental, neural and reproductive toxicant, can leach from bottles and sippy cups into the contents. Try Laken's lightweight aluminum water bottles made in Spain with one of the thickest, dent-resistant exteriors around and the BPA-free sippy cup from innovative designers Boon. 2. Green Toys: At this year’s toy fairs, eco-friendly products have been front and centre. Toys can be made ‘green’ in a number of ways, including using natural products such as cotton or wood with fewer harmful chemicals, reducing waste with less packaging and using recycled materials. With recent recalls for toys made in China, many toy buyers were keen on toys made in Europe. Go green for the little ones with organic cotton stuffies from Germany - luxuriously soft, super cuddly and simply adorable-looking. 3. Pass on Plastic Bags: Paper or plastic? Make it neither by toting your own reusable grocery bag and help reduce landfill waste. 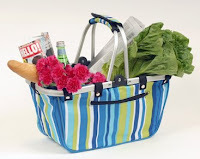 Lightweight and waterproof, the stylish eco-basket (pictured) collapses to fit in your purse or backpack. If this is too big of a commitment for every shop, find a second use for the plastic bags you do take home – line a small trash can, pick up after your dog or cushion those holiday postal packages. 4. Go Paraben Free: Increasing concern for the safety of the wide use of parabens – synthetic preservatives – in cosmetics and lotions has made natural products more popular than ever. Potential links have been reported between parabens, which research has shown can mimic the action of the female hormone estrogen, and cancer. As a healthy alternative, try 100% paraben-free natural body butter made in Canmore, Alberta or a great outdoors gift pack containing five different paraben-free body care products. And for the little ones, choose paraben-free body wash/shampoo and natural baby bum spray. 5. Become a Flexitarian: Swap one meat dish a week for a veggie plate. Why? Because raising produce is ‘cheaper’, in terms of energy consumption, than raising animals. Click here for a huge selection of tasty, meatless recipes. 6. Be Produce Picky: Make informed choices on your next shop for produce. Download the Shoppers Guide to Pesticides in Produce from the Environmental Working Group. The wallet-sized list distinguishes between the fruit and veg that tend to be higher in pesticides (ie. apples, spinach) from the produce with a lower count (ie. bananas, peas). Visit Lavish & Lime for a great selection of eco-friendly gifts for him, for her and the little ones. Many of these products are also Canadian-made.